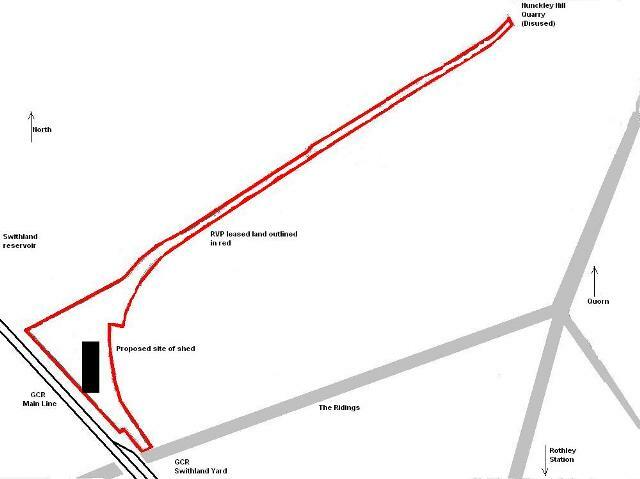 In 2005 RVP Ltd took a lease on a 3/4 mile section of the former Mountsorrel Railway, which runs off the GCR at Swithland Sidings. We are seeking to satisfy our single most important need - to provide secure weatherproof storage for our collection of historic vehicles. However the project has developed and we are also aiming to restore the branch line, and recreate Swithland Sidings original pupose as the interface between private branch and GCR main line. The project was launched as the Nunckley Hill appeal, but with considerable local community support has now evolved into the Mountsorrel Railway Project. A largely local volunteer team has formed to rebuild the railway and progress has been remarkable, and extends well beyond RVP's boundaries. Over £20,000 has been raised, and work done to many times that value by local companies and supporters. RVP Ltd wish to record our thanks to all of the volunteers involved, Lafarge Ltd, McCanns (Nottingham Ltd), GCR PLC and Mountorrel Parish Council for their support in this developing project.